Heligoland is an island off the coast of Nothern Germany. This island has already had a turbulent history before man set foot on this island of red sandstone. But its position in the North Sea, between Germany and the UK, also has made this island subject to territorial quarrels and military interest. This interest has caused the British military to fire one of the largest subnuclear explosion to sink Heligoland. 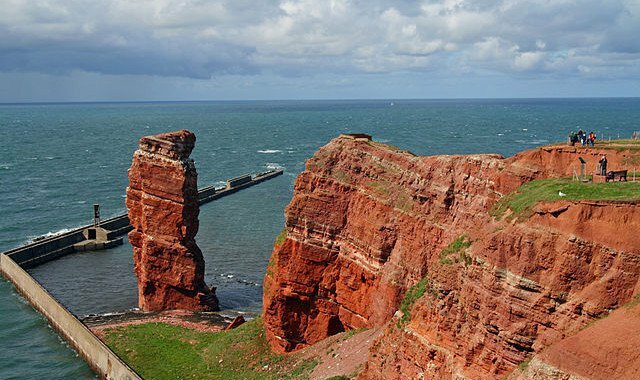 Claude Fröhle, Hans-Jürgen Kühn: Hochseefestung Helgoland. Eine militärische Entdeckungsreise 1891-1922 und 1934-1947. However, the geological history of this island is quite interesting. This beautiful red sandstone is the result of so-called lateritic erosion. This is erosion that results in the endproduct iron and aluminum. Now when we oxidate this material (let’s call it rust), we get the characteristic red sandstone. This happened about 250-200 million years ago and resulted in red sediments with a thickness of 1000m (3281 ft). Of course, other sediments were deposited on top and compaction and cementation solidified those sediments. These sediments deposited on top of some salt and the problem with salt is the following: If we consolidate salt just enough, it stops densifying and start reacting malleable. When salt starts to “flow”, we’re talking about salt tectonics. This salt started pushing up the overlying sediments including the red sandstone. After this some more erosion and several ice ages followed, leaving us with this beautiful island of red sandstone. Pratje, Otto. “Die Stadien in der Entwicklung der Insel Helgoland.” Erdkunde 2.4/6 (1948): 322-330. Oh, by the way, that explosion did not sink the island and it’s a tourist place now. The wall you see in the image is an excellent example of preservation of a unique geologic feature. Posted in Earth Science and tagged geology, Germany, history.